We tested monitors from eight different major manufacturers, living with these devices as they monitored a baby, but also challenging them to film in daylight, low light, and total darkness while walking down three flights of stairs. Parents of babies from birth onwards who want to actually see their sleeping child without opening the door and waking them, as well as parents of toddlers who could use a pair of eyes when the young ones could get up to trouble in their own room. Video baby monitors are the ultimate tool for peace of mind when your baby is sleeping in room, or even a room where it’s just too dark to see them. A cloud-connected video monitor can also double as a nanny cam—giving you a remote set of eyes to watch those who watch your children when you’re away. What Makes a Good Video Monitor? Before the 1980s, baby monitors didn’t even exist. What did mankind do for countless millennia before then? No one knows. Probably something with an array of mirrors or a series of flaming pyres on high mountain peaks. Historically speaking, baby monitors and wireless video systems have been notorious for indiscriminately sharing radio frequencies with other gadgets, meaning neighbors might have been able to eavesdrop on the things going on inside your house. Modern-day video monitors are smart enough to find the best frequencies to avoid interference and encrypt the signal from camera to monitor for standalone units or camera to router to online for smartphone-based monitors. And almost every model supports the option to add a second camera if you’d like to monitor another room, too. In our research, we found the biggest decision a buyer needs to make is this: Are you willing to use your smartphone to watch the video feed? Or would you prefer a more traditional standalone monitor? The Withings Home app takes usability a step further by allowing you to listen to the audio in the background on your smartphone if you’re looking for an experience closer to standalone video or audio monitors. The experience is so similar that Withings calls it the “Baby Monitor Mode.” It also has a slider setting to adjust notification sensitivity. It took some fine tuning to get the its alerts to pick up the baby crying, but not the air conditioner firing up outside. Surprisingly, we found battery life to be largely irrelevant. While every monitor we tested was optimized to extend its battery for several hours (often turning off the screen in the process), standalone video monitors tend to burn through battery so quickly that you’ll want to plug them in when you go to sleep anyway. You can acquire a perfectly functional, but fuzzy video monitor for $100. For $200, you can buy something that connects to your phone and streams HD. (There’s no financial savings in buying a camera without a standalone screen.) And you can add on extra cameras that can be viewed from a single smartphone app. After three weeks of head-to-head testing, the $200 Withings Home narrowly beat out the previous NightLight pick Dropcam Pro because of its greater features and much better app. Note: The Dropcam Pro refresh, the Nest Cam, has been unavailable for review at the time of the update. However, the updated application was available for testing with the previous NightLight pick, the Dropcam Pro. The controls, too, are superb. While most video monitors have esoteric menu systems that necessitate thick, old-school instruction manuals, the Home installs as easily as any app on your phone, and affords you familiar controls like pinch-to-zoom. The camera, which is the most elegant looking of the testing group, sits on a magnetic base that unfortunately cannot be mounted on the wall and must sit on a surface. The camera itself cannot be tilted or panned. It can only be adjusted manually within the concave base; meaning it can be pointed downward, at least a little bit, but its wide-angle lens lessens the needs for dramatic angle adjustments. The unit also include a “privacy mode” where the decorative cover can be rotated to block the camera and signal it to not record any audio or video. Other Withings Home features include an air quality monitor, a 2W speaker to play lullabies and talk to the baby and a subtle glowing nightlight. Its baby monitor notifications mode enables the camera’s audio with the app operating in the background. The Home has built in lullabies and a colored nightlight that can be turned on and set to a timer with a quick button push from the app. The lullaby volume and nightlight brightness and color (a Harvard study says red lights can aide going to sleep) can be adjusted remotely from the app as well. 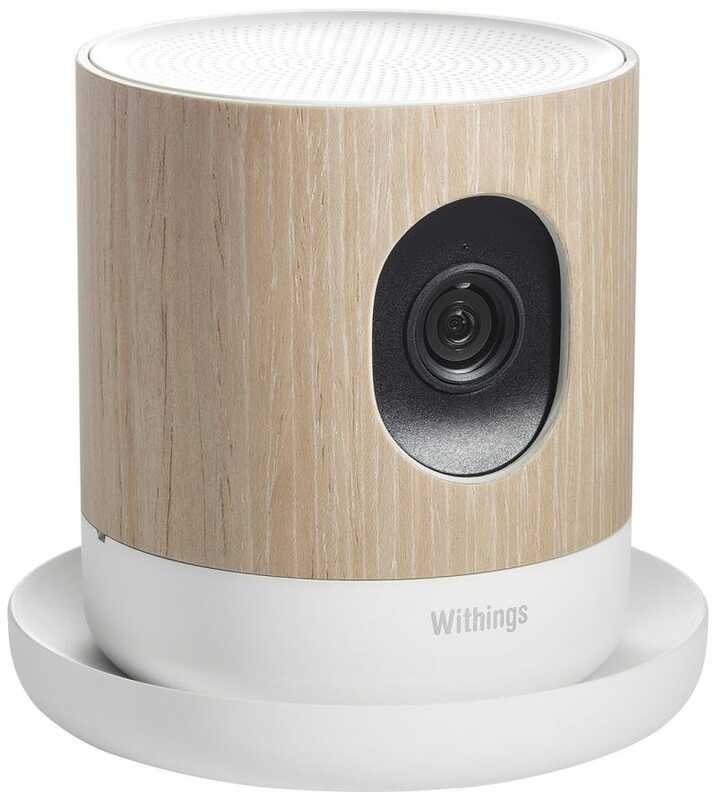 But every camera in this space comes with a compromise, and the Withings Home has a few catches. And, because of its unique video compression, even though the image is razor sharp, you sometimes lose the critical subtlety of breathing movement. There’s no option to view the feed from a web browser, which could be a dealbreaker for the work-from-home types wanted to keep the feed open in the home office. And lastly, the mount/stand leaves a lot to be desired. The Home gives you one option: Set it on a shelf or possibly nightstand while many others in the market provide wall-mounting capabilities or better (like the Nest Cam, which includes wall-, tripod- and magnetic-mounting capabilities). Britta O’Boyle at Pocket-Lint says: “The Withings Home is a lot more than just a smart camera - it’s the complete home solution it claims to be.” Megan Wollerton at CNET loves all of the extra features that the Home offers, although she doesn’t like its lack of a web-based interface and other features that make it less optimal as a security camera. Other reviewers ding the Home for issues like overly sensitive push alerts, but that issue had been corrected at the time of testing with the notifications sensitivity sliders. While we chose the Withings Home as our top pick, we know that not everyone wants a camera that connects to their phone. One expensive alternative that we grew to love was the Motorola MBP36 ($240). Its video sharpness doesn’t compete with the Withings Home, nor can it see nearly as wide, but the 3.5-inch screen still captured subtle movements, and you can change the camera angle remotely. Oddly enough, though, our absolute favorite feature was the design of its LED audio monitor. Both clear and soothing (the LEDs aren’t blinding, they’re just gentle, subtle lights), we kept it running long after formal testing was complete. We also found its range to be above average, as we were able to sneak down two flights of stairs in an old brick building and maintain signal. Three flights down, outside our building, we found the connection to mostly freeze, but the monitor never gives up—it keeps scanning for hints of frequency to give you audio and video updates. As a company, Motorola is a long-time pro at juggling radio frequencies across their products. Here, it shows. The Infant Optics DXR-8 has some great benefits over the Motorola MBP36 as a luxury standalone. It has super sharp image and includes the ability to change lens. This could become especially useful when your little one gets more mobile and a wide-angle lens (sold separately for $12) is necessary. Unfortunately, some interference problems and poor range keep it from being a top pick. It could not maintain constant connection while sitting on back porch (through three walls on the ground floor). We considered these alternatives from many manufacturers but can’t recommend them. [Philips Avent Digital Video Monitor ($145)] — The tiny 2.4-inch screen is illegibly murky, especially at night. [Motorola MBP18 ($100)] —Tiniest screen, unusably bad video at times. We hoped it’d be a good deal, but it wasn’t. [Withings Smart Baby Monitor $215] — We love Withings products. But our test unit wouldn’t even display video, and its connection was intermittent. Many user reviews express similar problems. We suspect this line may be a lemon and hope Withings refreshes it with better hardware soon. Update: Its refreshed unit, the Withings Home is our new best pick! [Samsung SmartCam HD Pro ($190)] — We couldn’t get our preproduction prototype working, even with Samsung’s support. *Update: A second go-around with this model functioned, but the image quality couldn’t compete and the app’s push alerts were entirely too sensitive and unable to fine-tune. [Levana Jena ($100)] — This budget camera has solid extras (like an LED audio monitor) and a nice build quality. But its camera just isn’t very good. Not a horrible half step up from an audio monitor, though, especially if you find a deal. [Levana Ovia PTZ ($220)] — Lavena’s high end camera was generally mediocre compared to competitors. [Levana Stella ($173)] — This standalone monitor had the biggest screen at 4.3 inches, but it lacks in image quality and operation. [D-Link Wi-Fi Baby Camera DCS-825L ($180)] — We liked this smartphone-based camera, but in just about every way, it’s not quite the entire experience quality of the Withings Home. Plus, its eyeball-shaped camera is strange to mount on a wall. Notably, though, you can run the D-Link without the cloud, on your local area network only. This might be very attractive for those worried about bandwidth, or those who don’t trust any online security in the post-Snowden era. [Dropcam Pro ($199)] — The Dropcam Pro was The Nightlight’s first top pick, but was bumped down due to its limited app functionality. If you’re an Android user, or interested in ponying up for the Nest Aware service (prices begin at $10 per month), this is a very good alternative pick and includes one feature the Withings Home lacks: zoned alerts (where you can just receive alerts for the crib, for example). We also excluded reviews of parental mainstay companies Angelcare and Summer Infant, as their video monitors tended to receive lower and less average reviews than the video monitors by major electronics companies. Foscam was excluded as well, following a series of frightening hacks that was handled poorly by the company. The Withings Home’s glass lens provides sharp pictures, but it may be prone to collect dust over time. Wipe gently with a soft cloth once a month. As with all lenses, wipe from the center outward, rather than in circular motions. More damage is often done cleaning lenses than anything else, so refrain from getting too obsessed. If you’d like to expand the system, additional Withings Homes can be purchased for $200. Because the Withings Home sends information out through the internet—and by “information” we mean video from within your household—it’s very important to follow best personal tech security practices to keep your privacy safe. From the crisp video to the lazy push notifications to the infinite range, the Withings Home was our favorite choice. And the best part is, once our baby grows up, we can set it up outside their room to bust ‘em if they ever try to sneak out of the house.